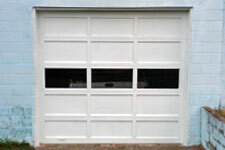 The model 732 is a commercial 1 or 2 car wooden garage door. The 732 is 1 3/4 thick and available in sizes up to 20 feet 2" long. The model 732 is made of solid hemlock or doug fur rails with no finger joints for a long life. The 732 is available with flat masonite panels with many optional glass design to fit your commercial needs. Replacement sections also available.